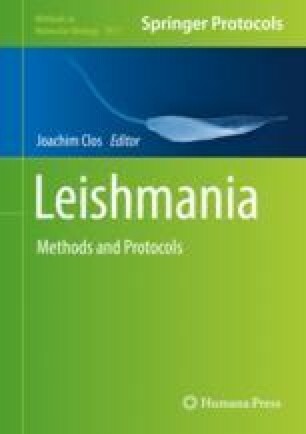 Postgenomic analyses of Leishmania biology benefit from rapid and precise methods for gene manipulation. Traditional methods of gene knockout or tagging by homologous recombination have limitations: they tend to be slow and require successive transfection and selection rounds to knock out multiple alleles of a gene. Clustered regularly interspaced short palindromic repeats (CRISPR)/Cas9 systems overcome these limitations. We describe here in detail a simple, rapid, and scalable method for CRISPR-Cas9-mediated gene knockout and tagging in Leishmania. This method details how to use simple PCR to generate (1) templates for single guide RNA (sgRNA) transcription in cells expressing Cas9 and T7 RNA polymerase and (2) drug-selectable editing cassettes, using a modular set of plasmids as templates. pT plasmids allow for amplification of drug resistance genes for knockouts and pPLOT plasmids provide a choice of different tags to generate N- or C-terminally tagged proteins. We describe how to use an online platform (LeishGEdit.net) for automated primer design and how to perform PCRs and transfections in small batches or on 96-well plates for large-scale knockout or tagging screens. This method allows generation of knockout mutants or tagged cell lines within 1 week.